I'd like to reduce my risk of investing solely in the U.S. stock market compared to the rest of the world. However, my concern is that perhaps the U.S. stock market already has such international exposure (e.g. many large multinational companies as well as U.S. companies that rely on international markets) that maybe it's pointless to invest in a broad international index. 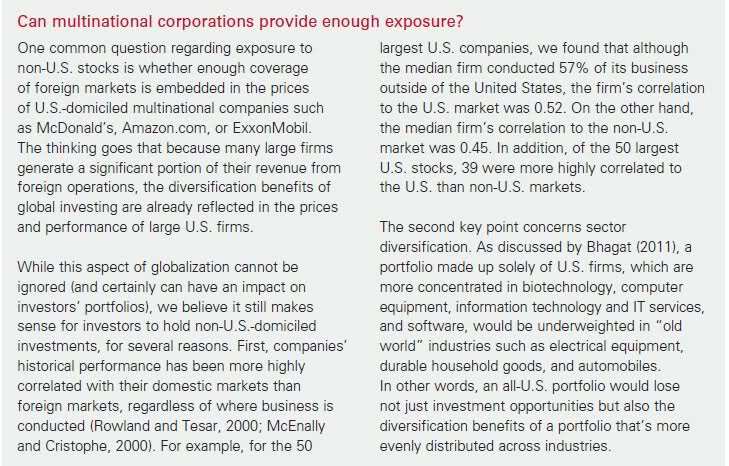 Is there a benefit to international diversification outside the U.S.? Lazy Portfolios do tend to have a mix of US bonds, US stocks and international stocks as there is something to be said for that international exposure being somewhat mixed in the big US companies. While Coca-Cola's growth may be overseas, there is something to be said for domestic sales playing a role in how well does that work. Same for Apple, Microsoft and other big names where you have to consider what are you considering in that international exposure. I'm just giving a link to the Lazy Portfolios for those wanting ideas of allocations that could make sense. Some of the lazy portfolios do get a bit complex as there is something to be said for emerging markets that can be quite different from developed countries and thus there is another distinction here when it comes to international investing. I would suggest looking at various asset classes and determining for yourself how finely you want to divide things up as you could take any of a handful of different sub-US indices like small-cap value that can be different than large-cap blend though there is also the potential for pure sector plays like REITs or Precious Metals. Asset Class Returns has limited data of various asset classes as an example of the returns to examine. Course the challenge is how well does some of the historical data relate given the current globalization in the world. The idea of a rebalancing bonus is another strategy to consider as well as going into bonds, small-caps, and other kinds of stocks besides the big stocks that are the S & P 500. S & P Small-cap 600 would be another set of stocks that may behave differently at times. Not the answer you're looking for? Browse other questions tagged united-states investing international risk-management hedge or ask your own question. An index fund in my 401k performed very well this year. How to deal with the gains? Why are US target retirement funds weighted so heavily towards US stocks?